Christine M. Beitl is a Ph.D. Candidate in the Department of Anthropology at the University of Georgia. Scholars of common property resource theory (CPR) have long asserted that certain kinds of institutional arrangements based on collective action result in successful environmental stewardship, but feedback and the direct link between social and ecological systems remains poorly understood. This paper investigates how common property institutional arrangements contribute to sustainable mangrove fisheries in coastal Ecuador, focusing on the fishery for the mangrove cockle (Anadara tuberculosa and A. similis), a bivalve mollusk harvested from the roots of mangrove trees and of particular social, economic, and cultural importance for the communities that depend on it. Specifically, this study examines the emergence of new civil society institutions within the historical context of extensive mangrove deforestation for the expansion of shrimp farming, policy changes in the late 1990s that recognized “ancestral” rights of local communities to mangrove resources, and how custodias, community-managed mangrove concessions, affect the cockle fishery. Findings from interviews with shell collectors and analysis of catch-per-unit-effort (CPUE) indicate that mangrove concessions as common property regimes promote community empowerment, local autonomy over resources, mangrove conservation and recovery, higher cockle catch shares, and larger shell sizes, but the benefits are not evenly distributed. Associations without custodias and independent cockle collectors feel further marginalized by the loss of gathering grounds, potentially deflecting problems of overexploitation to “open-access” areas, in which mangrove fisheries are weakly managed by the State. Using Ostrom’s Institutional Analysis and Development (IAD) framework, the explicit link between social and ecological systems is studied at different levels, examining the relationship between collective action and the environment through quantitative approaches at the fishery level and qualitative analysis at the level of the mangrove landscape. Implications for coastal and fishery management are discussed in the conclusions. Recent scholarship in sustainability science draws attention to the role of collective action and common property institutional arrangements in the study of social-ecological systems (Ostrom 1990; Kurien 1995; Berkes et al. 1998; Bray et al. 2004; Berkes 2005). Common property scholars have long maintained that collective action and strong local institutions can play an instrumental role in resource conservation, stewardship, or management (McCay and Acheson 1987; Feeny et al. 1990; Ostrom 1990; Smith and Berkes 1991; Bromley 1992; Smith and Berkes 1993; Feeny et al. 1996; Agrawal 2001; Bray et al. 2004; Rebellon 2004). The collective action behind common property arrangements has the potential to serve as a mechanism for averting Garrett Hardin’s (1968) “tragedy of the commons” if individuals successfully organize, cooperate, communicate, and trust one another for the benefit of resources and equitable distribution. Since the debut of Ostrom’s influential book Governing the Commons: Evolution of Institutions for Collective Action (1990) outlining eight design principles for the governance of common pool resources, several case studies have applied the framework in an attempt to strengthen propositions about the sustainable management of resources (McCay and Acheson 1987; Acheson 1989; Gibson et al. 2000; Agrawal 2001; Bray et al. 2003). One of the main contributions of this research has emphasized the importance of local actors and institutions, which has particular relevance to recent paradigm shifts in coastal and fisheries management from “top-down” to “participatory” co-management policies that empower local communities as legitimate stakeholders (see Pomeroy 1995; Guest 1999). While studies of common property have provided valuable insights into the internal processes of social organization, few have examined the outcomes most pertinent to the concept of sustainability. Questions still remain about the inherent assumptions of environmental stewardship implied by much of the common property literature (Ruttan 1998; Ruttan and Borgerhoff Mulder 1999; Lu 2001; Pollnac and Johnson 2005), especially since too often, little attention is given to ecology in relation to property rights (Berkes 1996). Only with the exception of a few studies (for example, see Acheson 1987; Smith and Berkes 1991; Bray et al. 2004), the direct link between social arrangements and the environment remains poorly understood, especially pertaining to the management of common pool resources (Anderies et al. 2004), and despite calls in the policy arena to understand the human dimensions of environmental change (National Research Council 1999). In this paper, I employ Ostrom’s (2011) Institutional Analysis and Development framework (IAD) to investigate the link between social processes that have contributed to mangrove wetland recovery, and how the outcome of certain local institutional arrangements contributes to the sustainability of the mangrove cockle fishery (Anadara tuberculosa and A. similis) on the Ecuadorian coast. Given concerns about overexploitation of mangrove cockles in the last 10 years (Elao and Guevara 2006; Mora and Moreno 2009; Mora et al. 2009) and its possible relationship to larger landscape processes of mangrove deforestation for the expansion of shrimp farming (Ocampo-Thomason 2006), the primary goal of this study is to assess the role of custodias, ten-year concessions granted by the State to local associations for community-based stewardship and sustainable management of mangrove resources. 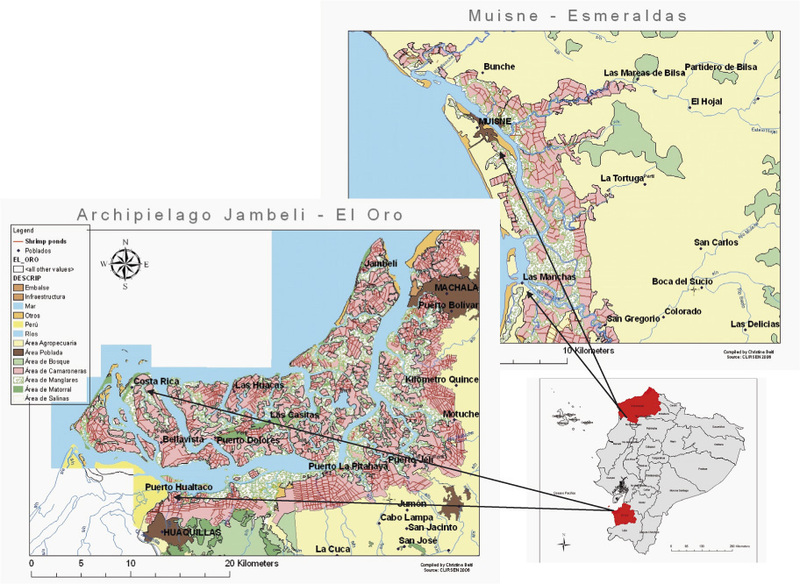 At the time of this research, the Ecuadorian State has granted concessions to 34 communities in all five coastal provinces, with the majority concentrated in the provinces of El Oro and Esmeraldas. Working in partnership with an external institution for technical assistance, local associations have been able to petition for a 10-year concession since the year 2000 by providing maps, a copy of the association’s agreement, a list of members, designated officers, and a management plan detailing the “sustainable use of resources” (Bravo 2007), often guided by rules highly reflective of Ostrom’s (1990) design principles. This study is confined to two specific questions. First, how do custodias, as a common property regime, promote environmental stewardship and sustainability in a social, ecological and economic sense? Second, does the common property regime and local valuation of that system suggest a viable institutional framework upon which to base conservation and management initiatives? The general aim of this study is to link social and ecological systems and explore the management implications for mangrove fisheries. Globally distributed throughout tropical coastal areas, mangrove wetlands supply a variety of goods to coastal communities such as fuelwood, commercial timber, charcoal, construction materials, thatch, fish, mollusks, crustaceans, medicinals, tannin, honey, incense, paper, and dyes for cloth (Snedaker 1986; Kovacs 1998; Mera Orcés 1999; Kaplowitz 2001; Glaser 2003; Walters et al. 2008). In addition to the goods for direct human use, mangrove wetlands are increasingly recognized for their multiple environmental services: nutrient cycling, erosion control, sediment trapping, groundwater recharge, water purification, storm surge/tsunami buffering, carbon sequestration, microclimate stabilization, and essential habitat, shelter, and nursery service for commercial, recreational, and subsistence fisheries (Ronnback 1999; Brander et al. 2006). Due to their previous stigmatization as unproductive “barren wastelands” (Selvam et al. 2003: 794) and a general lack of understanding about their environmental services, mangrove wetlands worldwide have been undervalued, often leading to their draining for agriculture, urbanization, and tourism or conversion to other uses (Valiela et al. 2001; Alongi 2002). While the deforestation rates of mangroves are generally decreasing, they still remain significantly higher than other forest types (FAO 2005). According to Valiela et al. (2001), mariculture contributes to about 52% of global mangrove loss and shrimp farming is the most significant type of aquaculture associated with mangrove deforestation. The vulnerability of mangroves to destruction further reflects global policies and institutions that have favored export-oriented development like shrimp farming over local tradeoffs (Martinez-Alier 2001). While shrimp mariculture offers the potential for economic development by increasing export earnings and generating employment in urban centers, the local reality in marginalized coastal communities has been dramatic landscape change and decreasing water quality (Southgate and Whitaker 1994; Dewalt et al. 1996; Cruz-Torres 2000; Barbier 2003; Stram et al. 2005). Along with ecological degradation, mangrove deforestation has also resulted in numerous social impacts such as community displacement, the loss of livelihoods, the erosion of resource rights, the reorganization of local economies, and an increase in economic disparity and social conflict (Stonich 1995; Dewalt et al. 1996; Primavera 1997; Cruz-Torres 2000; Stonich and Vandergeest 2001; C-CONDEM 2007). In some places around the world, including Ecuador, resistance movements have emerged in defense of mangroves (Cruz-Torres 2000; Stonich and Bailey 2000; Martinez-Alier 2001). According to the IAD framework, it is necessary to identify the structural variables (biophysical conditions, attributes of community, and rules-in use) that provide the context for the emergence of particular “action situations” and how the outcomes of those actions, in turn, feed back into the context, causing shifts in the structure. In Ecuador, after decades of mangrove clearing associated shrimp aquaculture (CLIRSEN-PMRC 2007), shrimp has risen to one of the top exports, despite set-backs in production due to White Spot Syndrome Virus (WSSV), a disease in cultured shrimp that devastated the industry in 1999. I argue that these events, along with both global and Ecuadorian resistance movements in defense of mangroves, and their consolidation into new civil society institutions, have partially served as a catalyst for the policy changes in the late 1990s that recognized the ancestral rights of local communities to mangroves and granted custodias to the first local associations in Esmeraldas and El Oro by the year 2000. In this paper, I focus on the mangrove concessions and their effects on the cockle fishery as the “action situations” that have contributed to the reversal of trends in mangrove cover from deforestation to reforestation and changed the nature of property relations among mangrove cockle collectors, thereby affecting the state of the resource. Isla Costa Rica, El Oro, Ecuador, one of the study sites for this research, was one of the first communities to receive a custodia in the year 2000 (Figure 1). The management plan has two main objectives: 1) mangrove conservation and restoration; 2) specific guidelines for the sustainable management of the cockle fishery (Bravo 2006). With regard to the first objective, each socio (member of the local association) is expected to report encroachment by expanding shrimp farms to the appropriate authorities and participate in periodic reforestation projects. While local mangrove restoration projects by 34 local associations throughout the coast are unlikely to make a big impact on a national scale, there are other institutions working toward the recovery of mangrove systems. As pointed out by Berkes (2005; 2006), the scaling up of local processes is particularly challenging for coastal and marine resources, but local institutions can reduce their vulnerability to external threats by engaging in cross-scale collaborations, such as co-management and social movement networks (Berkes 2002). Through the new cross-scale collaborations, changes in Ecuador have been implemented at multiple levels for broader-scale impacts. The new Presidential Decree 1391 (passed in March of 2010) is designed to regulate the shrimp industry and requires shrimp farmers to relinquish a certain percentage of their ponds to the government for the recuperation of lost mangrove habitat. Shrimp farmers sponsor reforestation projects carried out by local associations and other sectors of civil society. These processes, in turn, are also expected to further alter the biophysical variables that provide the context for mangrove fisheries and the institutions that govern them. A central concern of this study has been about the impact of mangrove loss on artisanal fisheries such as the mangrove cockle, a bivalve mollusk locally known as concha prieta in Ecuador and piangua in Colombia. Cockles have a broad range throughout mangrove-covered areas in Pacific littoral zone from Mexico to Peru (MacKenzie 2001), and high cultural and economic value in the mangrove communities of Ecuador and Colombia (Mera Orcés 1999; Rebellon 2004; Ocampo-Thomason 2006; Ecobiotec 2009; Kuhl and Sheridan 2009). It is traditionally harvested for subsistence by women and children in the Afro-Ecuadorian communities of Esmeraldas province, and by men and young boys throughout the rest of the country. The earliest records of its commercialization date back to a fisheries census conducted by the Instituto Nacional de Pesca (INP) in the 1970s (INP 1971). As a stationary resource, it is particularly vulnerable to habitat destruction and overexploitation. Studies have shown declining catches and shell sizes throughout the Ecuadorian coast in the last decade (Elao and Guevara 2006; Mora and Moreno 2009; Mora et al. 2009). The Subsecretaría de Recursos Pesqueros (SRP) established the first measures to regulate the fishery in 2001 by Ministerial Agreement No. 170 which recommended a closed season during the period of reproduction from February 15 to March 31, along with a prohibition of capturing shells smaller than 45 mm. The closed season was difficult to enforce and ended in 2008. The updated Ministerial Agreement No. 005 has called for the ratification and enforcement of regulations regarding the commercialization of shells below 45 mm. Since July 2008, SRP inspectors are increasingly being stationed in major disembarkation areas to randomly monitor the fishery by confiscating shells smaller than 45 mm and returning them to their habitat. However, this form of control does little to prevent collectors from hiding small shells in their backpacks or clothing and the fishery continues to decline. As a common pool resource, the fishery is challenged generally by the problem of subtractability, or multiple users compromising one another’s ability to maximize his/her share, and exclusion, or the difficulty of limiting resource use by the exclusion of outsiders (Ostrom et al. 1999; Berkes 2005). With regard to managing the fishery in Isla Costa Rica, the second objective of the custodia’s management plan has designated certain areas for periodic closure, rotation, monitoring, controls, and vigilance. Similar to some of the design principles described by Ostrom (1990), maps of the concessions have clearly defined the boundaries of the custodias (Principle 1). Second, all socios have made collective choice arrangements to abide by the rules regulating the allowable size (45 mm) and the monthly closure of certain areas to allow ecological processes such as larval dispersal, settlement, and growth (Principles 2 and 3). Third, a rotating guard system is obligatory to prevent access by outsiders (Principle 4). Fourth, those who fail to fulfill the guard obligations are sanctioned by losing their privileges to the closed areas during harvest periods, with the penalty increasing upon multiple offenses (Principle 5). Fifth, conflicts between socios are resolved in monthly association meetings and intruding outsiders are reported to the local authorities in Hualtaco (Principle 6). Finally, these tenure rights exist for a 10-year period with potential for renewal from the Ministry of Environment Forestry Department, and up until the time of this study, socios from Isla Costa Rica have enjoyed immunity from cockle confiscation by SRP authorities in Hualtaco (Principle 7). Other fisheries internally regulated along similar lines have shown social, economic, and ecological benefits for those involved (Acheson 1987). However, small-scale, locally-managed fisheries are still vulnerable to exogenous forces such as economic shifts, policy changes, or demographic changes (Thomas 2001; Curran and Agardy 2002; Acheson and Brewer 2003; Cinner 2005). In community-based natural resource management and co-management situations, it is not only necessary to study the institutional arrangements that promote sustainable catches, but also examine the local valuation of such management regimes to assess its social viability and potential persistence in spite of external forces that undermine their effectiveness. In Ecuador, as the mangrove landscape recovers simultaneously with the expansion of new institutions favoring local involvement and empowerment, there is opportunity to explore the three tenets of sustainability. The presence of a variety of management regimes in the study areas of El Oro allows for the testing of hypotheses about the effectiveness of different management strategies in a social, ecological, and economic sense. In the following sections, I will present results that illustrate the relationship between the institutional arrangements of the custodia in Isla Costa Rica and their effects on the resource through a comparative analysis of three types of management regimes: 1) Custodia Managed Fishery, areas tightly managed by rotation and fishery closures in Isla Costa Rica; 2) Custodia Open Fishery, areas of the concession in which the fishery is not tightly managed because of limited resources (human capital, lack of boats and money for gas); 3) Absence of Custodias, areas outside the concession frequented by collectors from Isla Costa Rica, neighboring communities, and the Port of Hualtaco and where access is defined by a first-come, first-serve basis. I posit that the loosely organized social movements in defense of mangroves of the early 1990s partially contributed to establishment of custodias that today permit some collectors to reap social and economic benefits while compromising other collectors’ agency and ability to fish sustainably. I do not contend that custodias as a form of common property is a panacea for fishery management, but I argue it is an innovative policy intervention that has great potential to support local autonomy over resources while promoting community empowerment and healthy mangrove habitat for higher cockle catch shares and larger shell sizes. The research reported here was conducted in two study sites in the province of El Oro, Isla Costa Rica and Puerto Hualtaco (see Figure 2). Isla Costa Rica is a small fishing village of 310 inhabitants within a network of mangrove islands that form part of the Archipiélago Jambelí. The majority of households depend on mangrove resources for their livelihood and subsistence and 70% depend on cockle collecting. Almost half of all 70 households have one or more individuals collecting full-time, 5–6 days a week, 2–4 hours per day. The daily fishing effort fluctuates between 15 and 30 collectors per day depending on tides and the lunar cycle, economic decisions, personal obligations, holidays, and health/physical wellbeing of the collector.1 Most collectors are between the ages 14 and 40, despite Ecuador’s labor laws that prohibit minors from working. But with access to secondary education 45 minutes away by boat and sometimes not accessible at all because of tides, those who have not migrated out to live in the nearest city of Huaquillas for study tend to work as fishers or cockle collectors on the island. Since many of them learn the activity at an early age, children as young as 6 years old have been seen digging in the mud alongside their parents or siblings during school vacations. Few collectors are older than 60 because of the physical demands of the activity, spending hours wading through knee-deep mud and climbing over branches while maintaining a crouched position to duck through the maze of low-lying branches. Many residents engage in livelihood switching as an adaptation to seasonality in fisheries and economic demand. Very few of them have ever worked on the near-by shrimp farms, even just for the three-day harvest every three months. In Isla Costa Rica, there are two local associations, Asociación Costa Rica and Nueve de Octubre. Over 50% of collectors on the island are members of one of the two local associations. The majority who are not socios, are their wives and children under the age of 18. Asociación Costa Rica is in charge of the 579 hectare custodia and they have made arrangements to include two men from the other association who are primarily dedicated to full time cockle collecting. Thirteen families practice cockle mariculture in holding pens of different sizes lined up in a creek directly front of their houses. Both associations have collectively-managed holding pens. Most collectors go out on a daily basis in one or two boats carrying 10–15 passengers to an area, leaving 1–4 collectors in various spots along the estuary. Others go out alone or in small groups of 2–5 on foot or in their personal motor-powered canoes. Shells are held for 1–3 days before being brought to Hualtaco for sale. Puerto Hualtaco is the main landing site and jump-off point for collectors from the city of Huaquillas, about a ten-minute bus ride from the port. INP estimates an average daily fishing effort of 254 collectors per day distributed among 9–10 motor boats and a few paddle canoes. Many shell collectors in Hualtaco are men or children of men originally from the rural mangrove communities in the archipelago who have migrated out within the last 1–2 decades to improve educational and employment opportunities for their families while maintaining their traditional livelihoods and identities as shell collectors. Others are migrants and children of migrants from the province of Loja in the Highlands whose migration to the coast is related to booming opportunities in the shrimp sector during the 1980s. The collectors are men ranging in age from 17–50. Being residents of an urban area, their livelihood switching is related to economic opportunities in other employment sectors that come and go. Some of them take up 3-day employment opportunities on the shrimp farms every 3 months for the harvest. One of the local associations has an agreement with a local shrimp farmer to secure those kinds of arrangements for the socios. Others may work in shrimp packing and processing facilities every 2 weeks during spring tides. There are five local associations predominantly made up of cockle collectors. Like the two associations in Isla Costa Rica, they are actively involved with larger-scale federations embedded within the national-level fisheries civil society organization, FENACOPEC, which in theory gives them access government institutions for greater participation, and in some cases, access to credit. The majority of collectors interviewed in Hualtaco (n=33) work 5–6 days a week, joining one of the nine large boats carrying up to 30 collectors into the archipelago as far as Isla Costa Rica. Initially, I explored social aspects of the fishery as part of an ethnographic study of cockle collectors for dissertation research carried out from January 2009 to December 2010 in the provinces of El Oro and Esmeraldas, Ecuador. After 3 months of observations and exploratory interviews in the five major ports most important for cockle landings, and participant observation in Isla Costa Rica, I designed a semi-structured questionnaire to be administered in four sites, one large and one small community in each province.2 To control for geographical differences and because of the presence of custodias, only the results from the two El Oro sites are presented here and comparative references are qualitatively made to the Esmeraldas sites. The questionnaire was divided into five sections: 1) informed consent; 2) information about cockles, including observations of CPUE and shell sizes; 3) baseline demographic information; 4) perceptions of change in mangroves and the fishery; 5) participation in civil society activities, social movements, and other forms of collective action. In Isla Costa Rica, I interviewed collectors in their homes at their convenience and counted the total number of shells while measuring their length with a 150 mm digital vernier caliper before or after the interview (21–170 shells/collector). Of the 58 cockle collectors interviewed, 41 had their CPUE measured, in some cases, more than once. On a data sheet, in addition to CPUE and shell size (mm), I recorded information about the site, time and resources spent, and the number of shells the collector planned to use for subsistence or as seed for their corral (mariculture holding pen). Additionally, I took four trips with different collectors to the gathering grounds for participant observation and also to test my own skills harvesting. All together, I interviewed 58 residents of Isla Costa Rica, including fishers, cockle collectors, and women, resulting in 69 observations that included both interview and CPUE data, including those who allowed me to measure their CPUE on different occasions from multiple harvest sites. In Puerto Hualtaco where the fast-paced pressures of market activity are much more intense, I carried out interviews in landing areas while two local field assistants measured all the shells of the catch (35–170 shells/collector) and recorded the data in a log sheet, which was later matched with the interview. Both members of local associations and independent collectors were randomly recruited with the help of cockle buyers and field assistants as they disembarked.3 On a few occasions without local field assistants, colleagues from INP randomly selected informants and measured shells while I conducted interviews. Some of the interviews were recorded with a digital voice recorder. On one occasion, I accompanied a group of collectors to the gathering grounds for observation, but remaining in the boat with its owner, the president of the provincial-level federation of local associations in El Oro. All together, there were 33 interviews, in which only one did not include CPUE data. Throughout the process of data collection, I presented results to informants on several occasions in Isla Costa Rica to invite feedback and generate further discussion. When data collection was finished, I organized two workshops in collaboration with INP to present their findings about the state of the fishery on a national level and the findings of my study at a more in-depth local level. Both associations in Costa Rica were invited to the first workshop held on the island. In Hualtaco, two representatives from each of the five associations and the larger federation were invited along with other socios and independent collectors who participated in my study. In addition to the individual interviews in Isla Costa Rica (n=58) and Puerto Hualtaco (n=33), the discussions at the workshop are particularly relevant to this study’s assessment of the social viability of the custodias as a management regime for the cockle fishery. In both sites, I confirmed with each informant that their sample was complete and not mixed with another collector’s. To prepare the data for analysis, samples suspected to have been measured improperly were first removed from the database. Since I failed to consistently clarify with the informant whether shells were removed for personal consumption or the corral during the early phases of the project, several cases were dropped for more conservative analysis. Only two of the observations in this analysis (n=102) were cases in which the CPUE had been mixed between two collectors; however, since this analysis is not concerned with individual-level characteristics that may bias shell catches and sizes, they are unlikely to affect the results. In only two cases in Isla Costa Rica, the collector reported to have already removed a marginal amount of small shells before CPUE measurement (7 and 10 shells) for his corral. To correct this problem, I adjusted the CPUE data by adding the number they reported to have removed, estimating shell size based on the lowest shell size of their catch. To test the claim that CPR arrangements are beneficial for resources, I examined the size frequency distribution of shells for the harvest sites, which were each coded and classified into one of the three types of property regimes: 1) Custodia Managed Fishery; 2) Custodia Open Fishery; 3) No Custodias, including sites around both Isla Costa Rica and Puerto Hualtaco (see Figure 2). A positively-skewed size frequency distribution with central tendency concentrated in the lower range would indicate signs of overexploitation and stress. The differences in mean size of both species A. tuberculosa and A. similis by type of property regime were examined by carrying out a comparison of means test and one-way analysis of variance (ANOVA) test (n=6565). I also compared the proportion of large shells to small shells by site for more robust results than those provided by average sizes alone, further illustrating descriptive information about the condition of the gathering grounds and the differences between them. A post hoc pair-wise comparison was then conducted to determine between which sites specifically the differences lie. The institutional robustness of common property arrangements in relation to sustainability could be better understood by examining its social viability in addition to the impacts on the resource. In the interviews, I enquired about perceptions of change in the fishery, concerns about overexploitation, whether informants agree with the custodias, and whether they believe that everyone should have the right to work in mangroves. Data from semi-structured interviews were coded into dummy variables to calculate the percentage of responses in agreement with the topics of enquiry and later to compare whether differences in opinions could be explained by field site, comparing Isla Costa Rica and Hualtaco. I employed a two-way measure of association cross-tabulation to test for significant differences between the two sites. The distribution of A. tuberculosa shell sizes differs significantly depending of the type of management regime from which they were harvested (Figure 3). The areas of the custodia in which the fishery is managed by periodic closures and rotation between sites have a normal distribution of shell sizes with low skewness, indicating that some collectors are harvesting small shells and not abiding by the rules concerning the minimum allowable size for commercialization. The other two areas within and outside the custodia where the fishery is not managed and open on a first-come, first-serve basis, are more similar in their distribution of shell sizes. The positive skew of those two types of management regimes indicates that shells extracted from “open-access” situations in which with fishery is not managed tend to be smaller in size, thereby supporting the hypothesis that areas where the fishery is not managed are more likely to exhibit signs of overexploitation. In addition to shell size, the average number of shells harvested per hour also differed significantly between the three property regimes (Figure 4). In the fishery-managed areas of the custodia, collectors are able to harvest 34 shells per hour. In the areas of the custodia not managed for the fishery, collectors harvest an average of 28 shells her hour, closer in average to nearby open-access around Isla Costa Rica and Hualtaco (26 shells per hour). Since the average number of shells per hour did not have a normal distribution in all three sites, I used non-parametric tests to evaluate whether those differences were significant. The Kruskal–Wallis test showed significant differences between the different types of management regimes (n=98, χ2=6.031, df=2, p=0.049). To test specifically between which management regimes the differences lie, I employed a Wilcoxon rank-sum test recommended for non-normally distributed data (Table 1). As suspected, the most significant differences lie between the parts of the custodia where the fishery is managed according to strict rules of rotation and access (group 1) and the open-access areas around outside the custodia that are accessed on a first-come, first-serve basis (group 3). Finally, the results of this study suggest that there is a relationship between resources and the social arrangements that govern them, thereby supporting my hypothesis about the role of common property arrangements in the sustainable management of mangrove cockles (Table 2). In the areas of Isla Costa Rica’s custodia that are rotated around closure periods of 6–30 days, one is more likely to harvest a slightly higher quantity and larger shells than in the open-access areas both within and around the custodia. 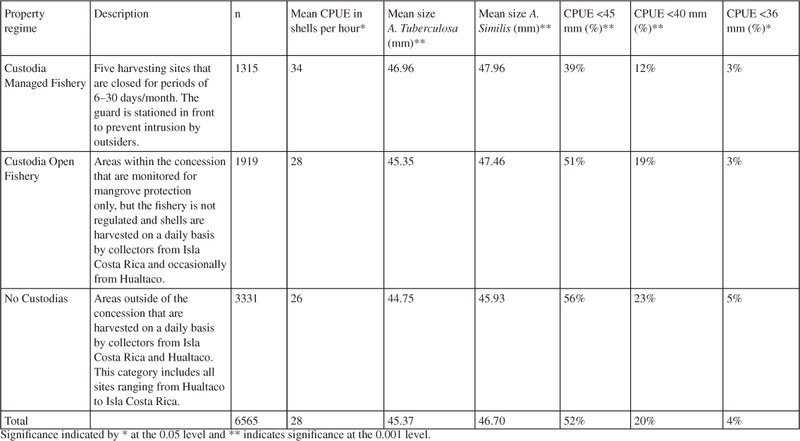 Moreover, those areas of the custodia have a higher abundance of large shells in proportion to small shells.4 A post-hoc 2-sample t-test confirmed significant differences between each of the paired sites for each variable at a level of 0.000 for all variables except CPUE <36 mm (p=0.004). The second proposition, that custodias are not only beneficial for the resource but also for the community of resource users, is only partially supported by the results here (Table 3). In both sites, Isla Costa Rica and Hualtaco, the majority of informants agreed that over the last 10 years, the cockle fishery has been declining, making their work more difficult. Over 90% of the informants in both sites were concerned about overexploitation and the possibility that this resource will soon become economically extinct. However, not all informants agreed the reasons for overexploitation or potential solutions, particularly with regard to custodias. In both Isla Costa Rica and Hualtaco, informants were concerned about the loss of gathering grounds, but there were significant differences in their opinions about the reasons for the loss of those areas. In Isla Costa Rica, 31% attributed the loss of gathering grounds to shrimp farms while only 3% in Hualtaco cited that as the primary cause. In contrast, 80% of collectors interviewed in Hualtaco attributed the loss of gathering grounds to custodias, while 52% recognized that as a problem in Isla Costa Rica. Not surprisingly, in Isla Costa Rica, 100% of those interviewed were in favor of the custodias, even though they had lost some of their gathering grounds to the concession of the near-by community Las Huacas (see Figure 2). The results of this study confirm some of the assumptions that the common property literature has made about the stewardship of resources. The findings illustrate that shell and capture sizes are significantly related to the ways in which the cockle fishery is managed. The arrangements outlined in Isla Costa Rica’s management plan reflect one way of dealing with the challenges of governing common pool resources: subtractability and exclusion (see Ostrom et al. 1999). The results confirm that the design principles governing common pool resources are beneficial for the state of the resource as a relatively closed system, open only to members of the Asociación Isla Costa Rica. In the areas of Isla Costa Rica’s custodia that are rotated around closure periods of 6–30 days, one is more likely to harvest a slightly higher quantity and larger shells than in the open-access areas both within and around the custodia. Moreover, those areas of the custodia have a higher abundance of large shells in proportion to small shells. Therefore, a collector may be driven by economic incentives to harvest and respect the rules of those areas since larger shells are considered by buyers to be “better quality” and sell for a higher price on the market. Since the socios perceive social, ecological, and economic benefits, they have further incentive to cooperate along the lines of the collective choice arrangements they have agreed upon as a group. While the rules concerning the extraction of small shells below the size limit of 45 mm is written into the management plan and largely understood by socios, there is no enforcement of these rules; rather, it is enforced by an honor system. Many collectors do not take small shells not only for ecological reasons and their understanding of ecological processes of larval dispersion and growth rates, but also because small shells are more difficult to sell. They may only harvest a handful of small shells to “completar,” or reach a round number since the price is determined by number and size rather than by actual weight. While personal economic incentives for not harvesting small shells other than as seed for the corral or to “completar” were not directly addressed in this analysis, the social repercussions for not following the rules may be just as compelling. This is demonstrated by the high levels of cooperation around the rotating guard system. Everyday, two of the forty socios are obligated to lose a day’s work on a rotating basis to sit in a boat in front of Isla del Puerco, an ideal location for monitoring the five fishery-managed harvest sites of the custodia. Those who deflect from this obligation are sanctioned by not being allowed to participate in the harvest of the areas during the open periods. For each offense, the sanctions become more severe, eventually resulting in his permanent exclusion from the monthly harvests. According to the president of the association, no one has ever violated the rule more than once. An alternative explanation for the significant differences in shell sizes between the types of management regimes may be reflective of ecological processes independent of human interaction beyond the scope of this study. For example, A. tuberculosa prefers harder soils characteristic of older, more well-established mangrove forests while the abundance of A. similis is more attributed to soft, saturated mud characteristic of young mangrove colonies. Furthermore, collectors have their “ecological” preferences about sites, which further contributes to differences between sites and fishing effort. Another explanation for the differences in shell sizes between the types of management regimes could be explained by the fishing effort, the number of collectors on a given day. The data show a gradual decline in shell size and the number of shells captured per hour with the fishery-managed areas of the custodia ranked first (Group 1), the open-fishery areas of the custodia ranked second (Group 2), and the open-access areas around Isla Costa Rica and Hualtaco ranked third (Group 3). While the t-test (for shell size) indicates that the shell size differences are significant between all of the pairs, the more conservative z-test (for shells per hour) illustrates that the differences between groups 1 and 2 and the differences between groups 2 and 3 were insignificant. According to the z-test, the significant differences in the number of shells harvested per hour lie between the fishery-managed custodias (Group 1) and open-access areas outside the custodia (Group 3). This may suggest that group 2 is a hybrid regime, although it is technically just as much “open-access” for cockle collecting as any of the other areas around Hualtaco and open to anyone on a first-come, first-serve basis. Possible reasons why the averages in the second group seem to be a middle ground could be attributed to a lower fishing effort, given its distance from Puerto Hualtaco. On the other hand, the lower fishing effort in the non-fishery-managed areas of the custodia could be attributed to political boundaries established by the concession. Generally, after ten years asserting their territorial rights over their custodia, the areas in concession are generally respected by collectors from Hualtaco. Trespassing is not very common even though there would be no sanctions in the open fishery areas of the custodia. 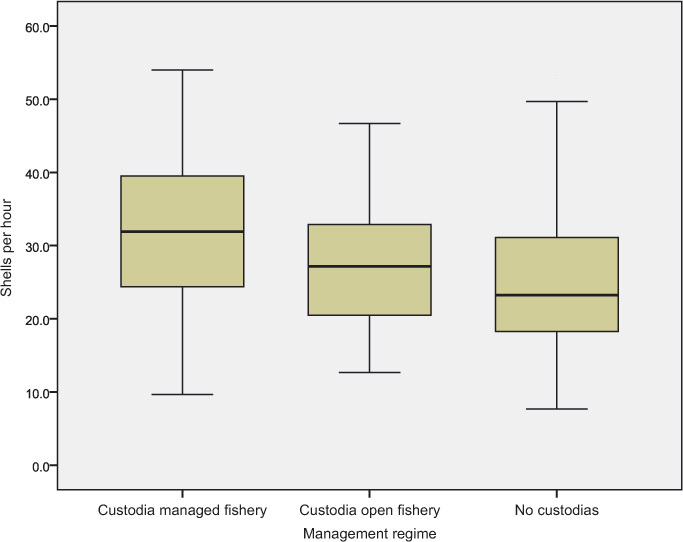 If the latter explanation is the case, then it lends further support for the assertion that custodias are beneficial to mangrove fisheries by the successful delineation and assertion of boundaries. One final point worth mentioning is that all shells harvested by collectors from Isla Costa Rica would be significantly larger on average if it weren’t for the corrals. Those who have corrals collect small cockles as seed, justifying the exploitation of shells below the legal size limit with the approval of other socios, although not all agree with the practice of cockle mariculture particularly for concerns about overexploitation. Practicing cockle mariculture is essentially an individualistic endeavor rather than a collective action which could potentially undermine the sustainability of the cockle fishery in Isla Costa Rica if too many families establish their own holding pens collecting small shells as “seed” (Beitl 2010). Currently, only 13 families have their own corral and some harvest them as few times as twice a year when demand is highest during Christmas and Easter holidays. Other users may harvest them more frequently (once every three months), or a handful on a weekly basis to completar when work days are unfruitful. As these results show, the benefits of the custodias are widely perceived by both collectors in Isla Costa Rica and to some degree by the collectors in Hualtaco. For the people in Isla Costa Rica, the custodias have allowed them to defend their livelihoods, traditions, identity, and the ecosystems upon which their families have depended for generations. By their 2005 mid-term evaluation, strengthening local organization and mangrove recovery were two of the outcomes listed as successful in the report (Bravo 2007). In the interviews, many expressed satisfaction with the perceived economic benefits. Naturally, a healthy habitat with more productive cockle harvest areas is beneficial to the resource users, but only for those who have access. Socios from Isla Costa Rica have access to gathering grounds that allow them to harvest an average of 8 more shells per hour than collectors from Hualtaco. This implies a significant increase in income of 30–40% based on a 3-hour work period and an average total CPUE of 86. Moreover, since the shells in those gathering grounds are larger, they can sell them for a higher price on the market. It also suggests that their work is easier for them, in that they can gather the same amount of shells in less time, allowing them enjoy their leisure time or dedicate themselves to another activity such as fishing, which potentially increases their income even further. Thus, the socios in Isla Costa Rica are very satisfied with the economic benefits of the custodias, providing further incentive to cooperate around the use of the resource and respect the rules governing their mangrove areas in custody. In addition to highly localized benefits, Isla Costa Rica’s experience with the concession has generated pride and a sense of ownership that contradicts what many other shell collectors believe are universal rights to work in mangroves, “as long as you do not destroy them,” as the shrimp farming industry has done. Despite the existence of laws that have protected mangroves, between 1969 and 2006, the original mangrove cover decreased by 26.5%, correlating with the growth of shrimp farming (CLIRSEN-PMRC 2007). The first shrimp farms in Ecuador were built in the salt flats and uplands during the 1970s and early 1980s. Often compared to “gold-rush fever” in other parts of the developing world (Cruz-Torres 2000; Jermyn 2000), the shrimp industry in Ecuador expanded rapidly in both geographical extent and political power, disrupting environmental services and displacing artisanal fishers while producing one of the nation’s most important exports. Artisanal fishers with little political power or economic resources could do very little but to stand by and watch their fishing grounds be bulldozed away. Between 1969 and 1995, the Archipiélago Jambelí lost almost half of its original mangrove cover to shrimp aquaculture (Bravo 2006). While local employment on shrimp farms tends to be seasonal and temporary, other sectors in packing, processing, and transportation boomed throughout the 1990s, mobilizing the migration of people to rural fishing villages and urban centers where the industry thrived. Urban centers like Muisne and Huaquillas benefited from the boom until 1999 when WSSV devastated the industry, closing hatcheries, processing and packing plants, and halting infrastructural development. Many people displaced by the crash of the shrimp industry in 1999 had no other choice in a precarious economic situation but to take up artisanal fishing until other employment became available. Between the degraded mangrove habitats and increased number of collectors, artisanal fisheries like that of the mangrove cockle, began to decline. Custodias have provided the appropriate legal backing for local communities with little economic and political power to defend the resources and environments upon which their families have depended for generations, resulting in stronger local institutions and empowerment. Now the very custodias that were established to defend the resource rights of ancestral communities serve as a new form of enclosure that denies fishing territory to those not affiliated with local associations. In the two study sites in El Oro, the incidence of conflict between shell collectors was higher than the two study sites in Muisne where there are no custodias (Beitl 2011). In the early years of Costa Rica’s custodia, conflicts among collectors from Hualtaco were more frequent as they were trying to assert their territory. Now, ten years after the granting of the concession, many of the collectors from Hualtaco have amicable relations with Isla Costa Rica, but continue to have conflicts with newly establishing custodias of Las Huacas and Pongalillo. Some informants in Hualtaco even attributed the decline of cockles directly to the problem of custodias. While in the past, gathering grounds were lost to shrimp ponds, today, collectors in Hualtaco are concerned about the loss of territory to custodias which are “spreading like a fever in the province of El Oro since now, everyone seems to be asking (the government) for a concession” (Mora, personal communication). “Scaling up” the common property arrangements by granting custodias to several coastal communities presents new challenges, as argued by Berkes (2005). This is especially true of Ecuador’s coastal zone, which like many others, is a heterogeneous social-ecological landscape characterized by diverse institutions and overlapping jurisdictions (Jentoft 2000). This case study of the custodias in El Oro is a good example of how local institutions can be strengthened by cross-scale interaction (Berkes 2002) and represents a step in the direction of understanding complexity and implementing integrated coastal management in Ecuador (Robadue 1995; Olsen and Christie 2000; Olsen et al. 2003; Christie 2005). On a larger scale beyond the common property arrangements of the mangrove fishery within the custodia, each socio is obligated to defend and participate in mangrove reforestation projects. Since the establishment of Isla Costa Rica’s concession in the year 2000, there have been two offenses by a local shrimp farmer wishing to expand his operation. As a “nested enterprise” (Ostrom’s design principle 8), members of the association worked with local authorities, non-government organizations, and the Universidad Técnica de Machala (their partner institution) to press charges and later replant the mangrove areas that were cleared, thereby further promoting healthy mangrove habitat for more productive fisheries beyond the boundaries of their custodia. These pockets of community-based conservation are likely to be occurring in the other 34 custodias on the Ecuadorian coast. Overall, the granting of mangrove concessions to local associations has been part of a slight shift in the broader political economic structure that has traditionally favored shrimp exports over local artisanal fisheries, resulting in widespread welfare impacts for the coastal communities where mangroves were cleared for shrimp farming. What started out as loosely organized grassroots resistance movements by activists and poor fishers with few resources in defense of mangroves, eventually consolidated into new civil society organizations, local fishing associations and cooperatives, multi-tiered institutional interactions, and the policy changes that gave rise to custodias throughout the country. These outcomes provide further feedback into the context, contributing to the recovery of mangroves in some areas, the strengthening of local communities and civil society, and new collaborations between institutions, which will eventually mobilize new action situations. The establishment of community-managed mangrove concessions may represent a potential solution to a crisis of overexploitation of mangrove fisheries in Ecuador, but could result in what Martinez-Alier (2001) referred to as a “tragedy of enclosures” ironically in reference to shrimp farming. As independent collectors and socios without concessions are increasingly losing their ground, their ability to harvest shells sustainably is compromised, possibly deflecting problems of overexploitation to open-access areas where shell sizes are significantly smaller, as this study has demonstrated. In order for these new local institutions to endure climate change and other exogenous forces, the issue of conflict between user groups will have to be addressed. On the other hand, Ecuador’s mangrove concessions represent one of the many valiant innovations to restore degraded coastal wetlands and improve the productivity of the artisanal fisheries that depend on healthy mangrove habitat. Communities that benefit from the mangrove concessions are empowered by the process and gaining more local autonomy over their resources in the face of broader social, economic, and environmental changes that continuously threaten to undermine their livelihoods, identity, and wellbeing. The co-management arrangements allow local associations to interact with other institutions at multiple scales for greater participation and reinforcement of ancestral rights to mangrove resources. Combining social and ecological methods is a useful tool for assessing sustainability. The IAD framework is moving in this direction beyond institutional analysis towards a broader understanding of social-ecological systems (Ostrom 2011). This study’s application of the IAD framework, confirms certain kinds of social arrangements can promote sustainable resource use on a local level, while also identifying certain vulnerabilities. This is particularly important considering that much of the literature still focuses on the negative anthropogenic impacts on the environment instead of interactions considered beneficial, dynamic, and adaptive from a social-ecological systems perspective (McCay and Acheson 1987; Berkes et al. 1998; Bray et al. 2004). One limitation of this research is that it has only been able to qualitatively speculate about the role of these local-level processes as they relate to the broader mangrove landscape. Further analysis should more systematically examine the relationship between these local-level processes and broader patterns of landscape change as Bray and others have done in Mexico (2003). Similar research endeavors that attempt to study the direct link between social and ecological systems at multiple scales call for interdisciplinary action and collaboration under the same theoretical framework. Such research in sustainability science not only advances theories that integrate social and natural sciences, but also provides useful analytical tools for sustainable development and conservation policy (Kates et al. 2001). 1Proyecto de Monitoreo Comunitario del Recurso Concha Prieta. Coordinado por Christine Beitl, Adolfo Cruz y Sonia Cruz, Isla Costa Rica, enero - junio de 2010 (Asociacion de Mariscadores Pescadores Artesanales y Afines “Costa Rica” 2010). 2Biologists from the Instituto Nacional de Pesca of Ecuador played an instrumental role in orienting me to ifferent field sites, introducing me to research contacts, and advising me with general information about the fishery throughout the duration of this research. INP is a public research institution whose mission is to provide the service of technical and scientific investigation to the fisheries-aquaculture sector to inform policy for the sustainable development of the fisheries to achieve its “optimal rational use” (Mora, personal communication 2010). 3Of the 36 recruited in Puerto Hualtaco, only three declined to participate. 4For purposes of simplification, this ratio was calculated only for A. tuberculosa since it is ecologically more abundant in many of the harvest areas and culturally more important. This research was carried out with generous support from National Science Foundation DDIG–BCS–0819376, the Wenner Gren Foundation, and the Fulbright program. I am grateful to three anonymous reviewers and my dissertation committee for their insightful comments and recommendations for improving this manuscript. I also thank my field assistants, colleagues at INP, and all the Ecuadorian cockle collectors who made this study possible. Acheson, J , ; The Lobster Fiefs Revisited: Economic and Ecological Effects of Territoriality in the Maine Lobster Fishery. In: McCay, B. J and Acheson, J. M eds. , editors. The Question of the Commons: The Culture and Ecology of Communal Resources. Tucson: University of Arizona Press. 1987. Acheson, J , ; Plattner, S , . Economic Anthropology. Stanford, Calif.: Stanford University Press. 1989. Management of Common-Property Resources. Acheson, J and Brewer, J. F , ; Changes in the Territorial System of the Maine Lobster Industry. In: Dolsak, N and Ostrom, E eds. , editors. The Commons in the New Millennium: Challenges and Adaptation. Cambridge, MA: MIT Press. 2003. Alongi, D. M (2002). Present State and Future of the World’s Mangrove Forests. Environmental Conservation 29(3): 331–349. Barbier, E. B (2003). Habitat-fishery linkages and mangrove loss in Thailand. Contemporary Economic Policy 21(1): 59–77. Berkes, F , ; Social Systems, Ecological Systems, and Property Rights. In: Hanna, S, Folke, C and Mäler, K. -G eds. , editors. Rights to Nature: Ecological, Economic, Cultural, and Political Principles of Institutions for the Environment. Washington, DC: Island Press. 1996. Berkes, F , ; National Research Council (U.S.). Committee on the Human Dimensions of Global Change. Cross-Scale Institutional Linkages: Perspectives from the Bottom Up. In: Ostrom, E, Dietz, T, Dolsak, N, Stern, P. C, Stonich, S and Weber, E. U eds. , editors. The drama of the commons. Washington, DC: National Academy Press. 2002. Berkes, F (2005). Commons Theory for Marine Resource Management in a Complex World. Senri Ethnological Studies 67: 13–31. Berkes, F, Folke, C and Colding, J , . Linking Social and Ecological Systems: Management Practices and Social Mechanisms for Building Resilience. Cambridge; New York: Cambridge University Press. 1998. Brander, L. M, Florax, R and Vermaat, J. E (2006). The empirics of wetland valuation: A comprehensive summary and a meta-analysis of the literature. Environmental and Resource Economics 33(2): 223–250. Bray, D, Ellis, E, Armijo-Canto, N and Beck, C. T (2004). The Institutional Drivers of Sustainable Landscapes: A Case Study of the ‘Maya Zone’ in Quintana Roo, Mexico. Land Use Policy 21: 333–346. Bray, D, Merino-Perez, L, Negreros-Castillo, P, Segura-Warnholtz, G, Torres-Rojo, J. M and Vester, H (2003). Mexico’s Community-Managed Forests as a Global Model for Sustainable Landscapes. Conservation Biology 17(3): 672–677. Bromley, D. W , . Making the Commons Work. San Francisco: Institute for Contemporary Studies. 1992. C-CONDEM. Certificando la Destrucción: Análisis integral de la certificación orgánica a la acuacultura industrial de camarón en Ecuador. Quito, Ecuador: Corporación Coordinadora Nacional para la Defensa del Ecosistema Manglar. 2007. Christie, P (2005). Is Integrated Coastal Management Sustainable?. Ocean and Coastal Management 48(3–6): 208. Cinner, J. E (2005). Socioeconomic Factors Influencing Customary Marine Tenure in the Indo-Pacific. Ecology and Society 10(1): 36. CLIRSEN-PMRC. 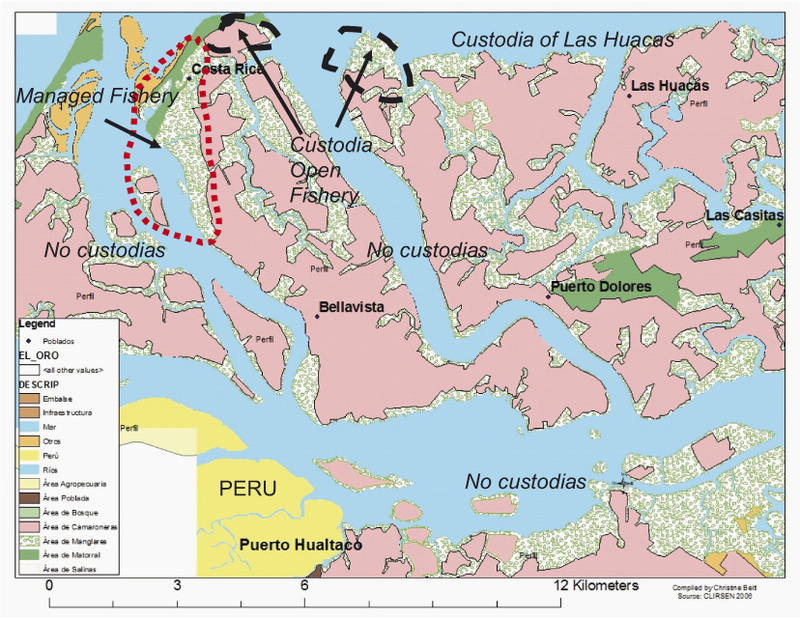 Actualización del Estudio Multitemporal de Manglares, Camaroneras y Áreas Salinas en la Costa Continental Ecuatoriana al Año 2006. Guayaquil, Ecuador: Centro de Levantamientos Integrados de Recursos Naturales por Sensores Remotos & the Programa de Manejo de Recursos Costeros. 2007. Cruz-Torres, M. L (2000). “Pink Gold Rush:” Shrimp Aquaculture, Sustainable Development, and the Environment in Northwestern Mexico. Journal of Political Ecology 7: 63–90. Curran, S. R and Agardy, M. T (2002). Common Property Systems, Migration, and Coastal Ecosystems. Ambio 21(4): 303–305. Dewalt, B. R, Vergne, P and Hardin, M (1996). Shrimp Aquaculture Development and the Environment: People, Mangroves and Fisheries on the Gulf of Fonesca, Honduras. World Development 24(7): 1193–1208. Feeny, D, Berkes, F, McKay, B. J and Acheson, J. M (1990). Tragedy of the Commons: Twenty-two years later. Human Ecology 18(2): 1–19. Feeny, D, Hanna, S and McEvoy, A. F (1996). Questioning Assumptions of the ‘Tragedy of the Common. Land Economics 72(2): 187. Gibson, C. C, McKean, M. A and Ostrom, E , . People and Forests: communities, institutions and governance. Cambridge: MIT Press. 2000. Glaser, M (2003). Interrelations between mangrove ecosystem, local economy, and social sustainability in the Caeté Estuary, North Brazil. Wetlands Ecology and Management 11(4): 265–272. Guest, G. S (1999). Global Vision and Local Lives: Policy, Participation, and Coastal Management in Ecuador. Culture and Agriculture 21(1): 1–13. Hardin, G (1968). Tragedy of the Commons. Science 162: 1243–1248. INP. Guayaquil, Ecuador: Instituto Nacional de Pesca, Instituto Nacional de Estadistica, Direccion General de Pesca. 1971. Segundo Censo Pesquero Nacional. Jentoft, S (2000). Co-managing the Coastal zone: Is the Task Too Complex?. Ocean and Coastal Management 43(6): 527–535. Jermyn, L (2000). White Gold. E Magazine: The Environmental Magazine 11(3): 10. Kaplowitz, M. D (2001). Assessing Mangrove Products and Services at the Local Level: The Use of Focus Groups and Individual Interviews. Landscape and Urban Planning 56(1–2): 53–60. Kates, R. W, Clark, W. C, Corell, R, Michael Hall, J, Jaeger, C. C, Lowe, I, McCarthy, J. J, Schellnhuber, H. J, Bolin, B, Dickson, N. M, Faucheux, S, Gallopin, G. C, Grubler, A, Huntley, B, Jager, J, Jodha, N. S, Kasperson, R. E, Mabogunje, A, Matson, P, Mooney, H, Moore Iii, B, O’Riordan, T and Svedlin, U (2001). Environment and Development: Sustainability Science. Science 292(5517): 641–642. MacKenzie, C. L (2001). The Fisheries for Mangrove Cockles, Anadara spp., from Mexico to Peru, With Descriptions of Their Habitats and Biology, the Fishermen’s Lives, and the Effects of Shrimp Farming. Marine Fisheries Review 63(1): 1–39. Martinez-Alier, J (2001). Ecological Conflicts and Valuation: Mangroves versus Shrimps in the Late 1990s. Environment and Planning C-Government and Policy 19(5): 713–728. McCay, B. J and Acheson, J. M , . The Question of the Commons: The Culture and Ecology of Communal Resources, Arizona studies in human ecology. Tucson: University of Arizona Press. 1987. Mera Orcés, V , . Género, Manglar, y Subsistencia. Quito, Ecuador: Abya Yala. 1999. Mora, E and Moreno, J (2009). La Pesqueria Artesanal del Recurso Concha (Andara tuberculosa y A. similis) en la Costa Ecuatoriana durante el 2004. Boletín Cientifico y Técnico 20(1): 1–16. Mora, E, Moreno, J and Jurado, V (2009). La Pesquería Artesanal del Recurso Concha en las Zonas de Esmeraldas y El Oro, Durante el 2008. Boletín Cientifico y Técnico 20(2): 17–36. Ocampo-Thomason, P (2006). Hoanh, C. T, Tuong, T. P, Gowing, J. W and Hardy, B eds. Mangroves, People and Cockles: Impacts of the Shrimp-Farming Industry on Mangrove Communities in Esmeraldas Province, Ecuador. Environment and Livelihoods in Tropical Coastal Zones: Managing Agriculture-Fishery-Aquaculture Conflicts. Oxon, UK: CAB International. Olsen, S. B and Christie, P (2000). What Are We Learning from Tropical Coastal Management Experiences?. Coastal Management 28(1): 5–18. Ostrom, E , ; Governing the Commons: Evolution of Institutions for Collective Action. Ostrom, E ed. , editor. Cambridge: Cambridge University Press. 1990. Ostrom, E (2011). Background on the Institutional Analysis and Development Framework. Policy Studies Journal 39(1): 7–27. Pollnac, R. B and Johnson, J , ; Folk Management and Conservation of Marine Resources: Towards a Theoretical and Methodological Assessment. In: Kishigami, N, Savelle, J. M and Hakubutsukan, K. M eds. , editors. Indigenous Use and Management of Marine Resources. Suita, Osaka: National Museum of Ethnology. 2005. Pomeroy, R. S (1995). Community-based and Co-management Institutions for Sustainable Coastal Fisheries Management in Southeast Asia. Ocean and Coastal Management 27(3): 143–162. Primavera, J. H (1997). Socio-Economic Impacts of Shrimp Culture. Aquaculture Research 28(10): 815–827. Rebellon, C (2004). Relacion entre el stock de un recurso de propiedad comun y el crecimiento de la poblacion que explota. El caso de la extraccion de piangua en la ensenada de Tumaco, Colombia. Desarollo y Sociedad, : 179–219. Robadue, D ed. , editor. Eight Years in Ecuador: The Road to Integrated Coastal Management (CRC technical report ; no. 2088).. Narrangensett, R. I.: Coastal Resources Center, University of Rhode Island. 1995. Ronnback, P (1999). The ecological basis for economic value of seafood production supported by mangrove ecosystems. Ecological Economics 29(2): 235–252. Ruttan, L (1998). Closing the Commons: Cooperation for Gain or Restraint?. Human Ecology 26(1): 43–66. Ruttan, L and Mulder, M. B (1999). Are East African pastoralists truly conservationists?. Current Anthropology 40: 621–652. Selvam, V, Ravichandran, K. K, Gnanappazham, L and Navamuniyammal, M (2003). Assessment of community-based restoration of Pichavaram mangrove wetland using remote sensing data. Current Science 85(6): 794–798. Smith, A. H and Berkes, F (1991). Solutions to the “Tragedy of the Commons”: Sea-urchin management in St Lucia, West Indies. Environmental Conservation 18(2): 131–136. Smith, A. H and Berkes, F (1993). Community-Based Use of Mangrove Resources in St. Lucia. The International Journal of Environmental Studies 43(2–3): 123–132. Snedaker, S. C , ; Traditional uses of South American mangrove resources and the socio-economic effect of ecosystem changes. In: Kunstadter, P, Bird, E and Sabhrasi, S eds. , editors. Man in the Mangroves. Tokyo: The United Nations University. 1986. Southgate, D. D and Whitaker, M. D , . Economic progress and the environment: one developing country’s policy crisis. New York: Oxford University Press. 1994. Shrimp Mariculture and Coastal Ecosystems. Stonich, S (1995). The environmental quality and social justice implications of shrimp mariculture development in Honduras. Human Ecology 23(2): 143–168. Stonich, S. C and Bailey, C (2000). Resisting the Blue Revolution: Contending Coalitions Surrounding Industrial Shrimp Farming. Human Organization 59(1): 23–36. Stonich, S and Vandergeest, P , ; Violence, Environment, and Industrial Shrimp Farming. In: Peluso, N. L and Watts, M eds. , editors. Violent environments. Ithaca: Cornell University Press. 2001. Stram, D. L, Kincaid, C. R and Campbell, D. E (2005). Water Quality Modeling in the Rio Chone Estuary. Journal of Coastal Research 21: 787–810. Thomas, F. R (2001). Remodeling Marine Tenure on the Atolls: A Case Study from Western Kiribati, Micronesia. Human Ecology V29(4): 399–423. Valiela, I, Bowen, J. L and York, J. K (2001). Mangrove Forests: One of the World’s Threatened Major Tropical Environments. BioScience 51(10): 807–815. Walters, B. B, Rönnbäck, P, Kovacs, J. M, Crona, B, Hussain, S. A, Badola, R, Primavera, J. H, Barbier, E and Dahdouh-Guebas, F (2008). Ethnobiology, Socio-economics and Management of Mangrove Forests: A Review. Aquatic Botany 89(2): 220–236. Shrimp farming and mangroves in the two study areas in the provinces of El Oro and Esmeraldas. Property Regimes in Isla Costa Rica and around Puerto Hualtaco. Note that the boundary lines around the areas of Isla Costa Rica’s custodia are not definitive. 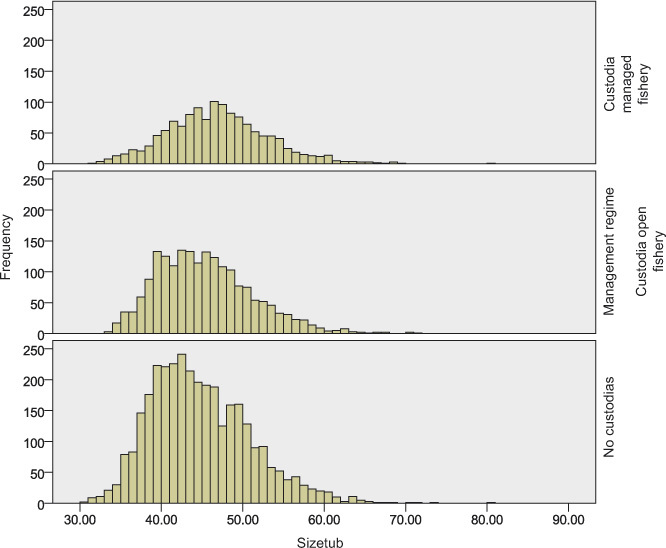 Size frequency distribution of A. tuberculosa captured from three types of management regimes in El Oro, Ecuador (n=6565). There are significant differences in shell sizes between the three types of management regimes (F=61.665) and (p=0.000). The number of shells gathered per hour differs significantly between the three property regimes: 34/hour in the managed areas of Isla Costa Rica, 28/hour in the areas of the custodia where the fishery is not managed and 26/hour in open access areas around Hualtaco and Isla Costa Rica (n=98, χ2=6.031, df=2, p=0.049).